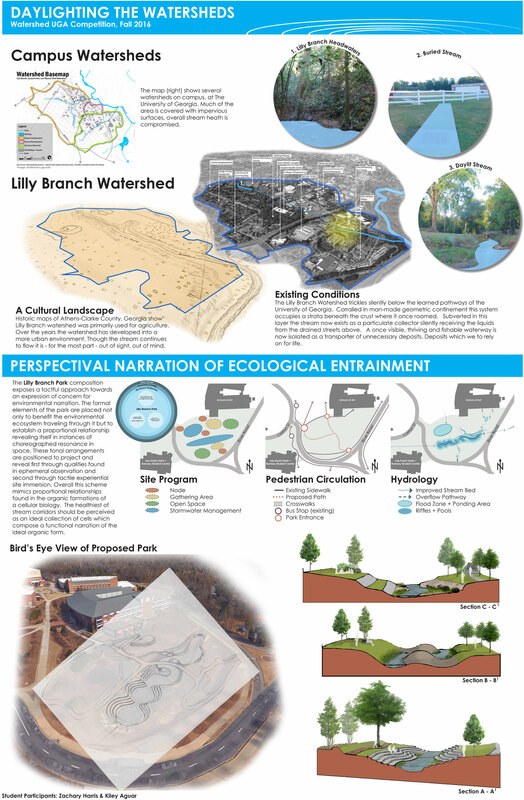 Kiley Aguar of the College of Environment and Design and Zachary Harris of the Lamar Dodd School of Art submitted the winning Daylighting the Watershed proposal in the Lilly Branch watershed for "Perspectival Narration of Ecological Entrainment." Their design is for a park on Lilly Branch that contributes to watershed restoration while reflecting natural forms and relationships. Athens, Ga. — Watershed UGA, an interdisciplinary initiative to create a culture of sustainability focused on campus waterways, has awarded prizes of $1,000 each to two teams of University of Georgia students for their winning entries in the Daylighting the Watershed design competition. Water is integral to life, but the problems of local watersheds are often hidden beneath us, said Laurie Fowler, executive director for public service and external affairs at the Odum School of Ecology and one of Watershed UGA’s project leaders. In a technical sense, “daylighting” refers to the process of physically revealing streams that were previously covered. Watershed UGA’s design competition extended the concept of daylighting to include art, signage, installations and other creative works that bring awareness to hidden streams and their complex relationships to social, historical, economic and environmental conditions. Fifteen teams submitted designs to the competition from diverse departments across campus, including art, engineering, ecology, music composition and landscape architecture. Fifteen third-grade students from Barrow Elementary School also worked together to contribute designs for the competition’s poster exhibition, currently on display at the Jackson Street Building. Proposals were requested for two high-traffic sites on campus-one in the watershed of Tanyard Creek, which starts in Athens and runs under Sanford Stadium to the North Oconee River, and another in the watershed of Lilly Branch, which begins in Five Points and flows by the Lamar Dodd School of Art. “The competition entries show us how students from a wide range of disciplines including the arts, environmental science, engineering and landscape architecture chose to work together on complex problems and propose solutions that are highly original, thoughtful and provocative,” said Mark Callahan, artistic director of Ideas for Creative Exploration, an interdisciplinary initiative for advanced research in the arts at UGA. The proposals, which included sculpture, rain gardens, living bus stops and apps, all highlight the water resources that are often hidden in pipes below ground to encourage an ethic of protection and restoration. Winning proposals were chosen by an interdisciplinary panel based on their merit, innovation, collaboration, sustainability and presentation. Kiley Aguar of the College of Environment and Design and Zachary Harris of the Lamar Dodd School of Art submitted the winning proposal in the Lilly Branch watershed for “Perspectival Narration of Ecological Entrainment.” Their design is for a park on Lilly Branch that contributes to watershed restoration while reflecting natural forms and relationships. In the Tanyard Creek watershed, the winning proposal was “Up-cycling Tanyard Creek,” submitted by Brittni Viskochil and John Gnann of the Lamar Dodd School of Art and Stephen Ingram of the College of Engineering. They proposed a metal tree sculpture to display trash that is removed from Tanyard Creek during watershed cleanup events. Prizes were awarded at a roundtable discussion, “How Artists, Scientists and Environmental Activists Can Work Together,” featuring Elizabeth Corr, manager of art partnerships for the Natural Resources Defense Council, in early November as part of UGA’s Spotlight on the Arts. All 15 Daylighting the Watershed designs will be on display in the Jackson Street Building through the end of the semester. Watershed UGA is spearheaded by the Odum School of Ecology and the UGA Office of Sustainability, in partnership with Public Service and Outreach, the Center for Teaching and Learning, the Center for the Integration of Research, Teaching and Learning, the Franklin College of Arts and Sciences, the College of Agricultural and Environmental Sciences, the College of Education, the College of Engineering, the College of Environment and Design, the Warnell School of Forestry and Natural Resources, the School of Law, the College of Public Health, the Graduate School, the Facilities Management Division, the Office of Service-Learning, the Office of the University Architects for Facilities Planning, University Housing and Athens-Clarke County. More information is available at www.watershed.uga.edu.